Christian Media in Nigeria : Abuja! Get Ready To ‘Be All You Can Be’, The Catalyst Is Coming To Town! Abuja! Get Ready To ‘Be All You Can Be’, The Catalyst Is Coming To Town! 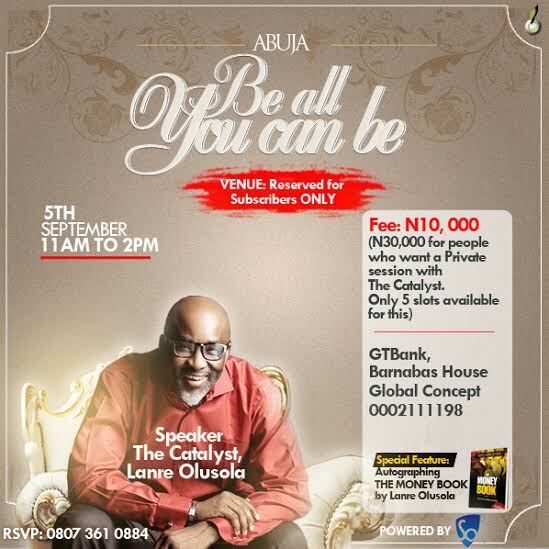 It's time to BE ALL YOU CAN BE with Lanre Olusola, fondly known as The Catalyst! If you are in Abuja Nigeria, don't miss this awesome opportunity to change your life forever. The lineup for Saturday includes the thought provoking interactive sessions with the Catalyst, which will be followed by one-on-one sessions for just the few people who have signed up. This will culminate in the book signing of #TheMoneyBook by Lanre Olusola, a book on misconceptions about the psychology of wealth. More details about this event after the cut. To attend the general session costs N10,000 only. To attend both the general session and also have a private session with the Catalyst costs an investment of N30,000 only. Please regularize your payment before Wednesday, so as to confirm your seat, especially if you are a one-on-one candidate.‎ If you have paid fully, please ignore this paragraph.